Graceful Child is our newest baby bracelet design. This beautiful little baby bracelet has a soft, elegant look. Designed with white freshwater pearls and sterling silver. Two beautiful sterling beads are set with sparkling clear cz. 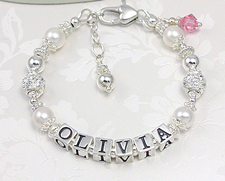 Graceful Child baby name bracelet is an heirloom quality design and includes a free birthstone charm (shown). This wonderful new bracelet is resizable to grow with your child. 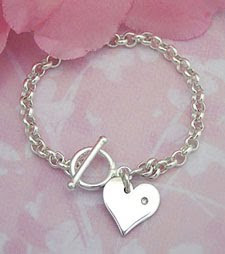 We have also added Diamond Girl, a sterling silver toggle-style baby bracelet. This adorable little bracelet has a small toggle clasp just the right size for babies. Dangling from the clasp is a polished sterling silver heart set with a genuine 1 pt. diamond! You can have an initial engraved on the heart if you choose. We've been adding a number of new bracelets and necklaces for babies and children to our store. Come by and see all of our new items today!